This Sunday I finished hike number 22/52 for the 52 Hike Challenge in 2015, and have now completed 253 of my goal of 1000 miles for this year. After hiking in the lowlands on Saturday in 90 degree temps, I decided it was better to avoid the heat and plan a Sunday hike at higher elevation. After considering a few options, I settled on Telegraph Peak from Manker Flats. It was a bit of a scouting mission in two ways. First, I wanted to see the conditions of 3 T’s trail, as I plan to do a hike with Mt. Baldy, the three peaks on 3 T’s, and bag Ontario, Bighorn, and Cucamonga on one epic day. 3 T’s is in good condition, so that 7 peak hike could be a go pretty soon. The second reason was to scout for a good camping spot on the summit of telegraph, as I hadn’t been in a while, but remembered the incredible views, and would like to spend the night on top sometime this summer. Julia and my two dogs accompanied me on this hike, as we scaled 3500 ft of elevation over 13 miles. I knew it was going to be a great day as soon as we arrived to the Manker Flats parking area, with bright blue skies above painted by beautiful wispy cirrus clouds. With the 90 degree heat expected in the valley, it was nice to feel the cool breeze and 50 degree temps when I stepped out of the car. We made our way up to the Baldy notch via the Mt. Baldy fire road, and veered right towards Thunder Mountain. Thunder Mountain is the first “T” in the 3 T’s trail, followed by Telegraph and Timber Peaks. We spent some time taking in the views from Thunder Mountain and let the dogs roam around exploring the ski lift. The 3 T’s trailhead is at the base of Thunder Mountain with a signpost and markers. Having climbed to the top of Thunder Mountain, 3 T’s begins with a descent to a saddle that offers great views of the high desert. The view from this saddle is one of my favorites in all the San Gabriels. After reaching the saddle, the trail climbs a series of switchbacks. The 3 T’s trail continues on towards Timber Mountain and Icehouse Canyon once you reach the top of the switchbacks, but if you veer left at the “3 T’s Trail” sign, you’ll see a use trail that breaks from the main trail and leads to the summit of Telegraph Peak. The views from the summit were spectacular and unusually clear. Telegraph peak is a bit of a birds nest peak, with a sharp point that falls off on all sides. From the top, you can see in all directions with views of Mt. Baldy, Ontario Peak, Cucamonga Peak, San Gorgonio, San Jacinto, the high desert, and much more. This is not a popular hiking trail and the peak here is not one that’s often visited. It’s nice on such a small peak, as we really got to feel the solitude without interruption. We took our time at the summit and really soaked up the views while there. I knew it was time to go when Isla started getting adventurous with her new found love of bouldering and Lilly wanted to check some things out down the hill. We made our way down the same way we came up and hiked back to the car at a leisurely pace. It was an incredible day for a hike, and I couldn’t have been happier with our decision to go to Telegraph Peak. I hope the skies are this clear when I return for the 3 T’s 7 peak hike, and/or an overnighter. It was a perfect day! It’s rare to get this kind of clarity in Southern California. Looks like an awesome hike! Great photos, love the way the clouds streak across the blue sky. Thank you! 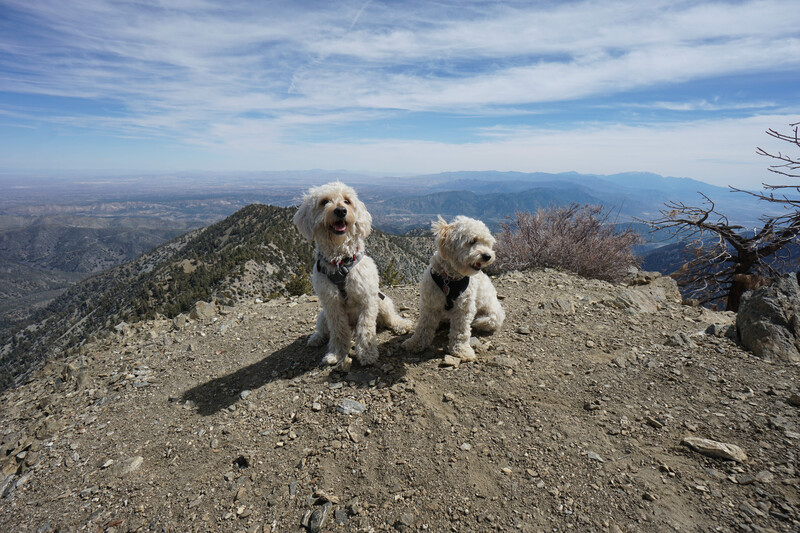 It’s one of my favorite hikes in the San Gabriels! Thanks! They definitely love their weekend hikes! Looks like a great hike with outstanding views. The clouds are really gorgous, what a beautiful view 🙂 Thanks for sharing this with us.